02-Sep-2000 -- North Carolina is unique among the United States in that it has huge expanses of water protected behind a strip of barrier islands. These bodies of water provide support for all sorts of wildlife, recreation, and fishing. The two main areas of water behind the islands (called the Outer Banks) are the Pamlico and Albemarle Sounds. The confluence we were hunting fell in the southern part of the Albemarle Sound. This water-based confluence was well within sight of land, so Laurie and I rented a boat, and roped my kayaking parents into a "three hour tour" over Labor Day weekend. After a early start, we left Greenville, NC, and headed northeast on various state roads until we met up with US-64, somewhere around Williamston. We took 64 east to Columbia, taking smaller and smaller roads, until we wound up at the end of a gravel road at a place called Pledger Landing. Braving the bugs, we slathered on sunscreen, set the GPS with the route, popped the kayaks in the water, and headed out into the Albemarle Sound. We were about 6.3km from the confluence. It was 10:45am. The forecast was for scattered showers, but they all seemed to be elsewhere that day. Clouds were in abundance as we paddled out to the spot. The breeze was a refreshment, and fortunately not a hinderance. Several boats were out pulling up crab pots and fishing. I called out the 0.5 kilometer marks as they fell. Laurie's and my "dual engined" kayak was mitigated by the fact that we were both wildly out of shape, so the intrepid explorers managed to stay in close formation. After almost 2 hours of paddling, suddenly we were on top of it. Even though the wide open space grated us the best satellite reception possible, the (until now unnoticed) current kept us from hitting the point exactly. Getting within 40 meters and calling it good, we snapped a few pictures and headed for the shore. Now assisted by the current, our time back was cut nearly in half. This was, as they say, a very good thing. We made the shore by 1:45pm, stumbled out of the boats (and least Laurie and I did), bolted for the cooler and consumed the entire contents in the span of a few minutes. After a brief rest, we loaded the boats back on to the cars and headed for home; stopping only to get more fluids, and braving the showers that sprung up all over eastern NC almost as soon as we were out of the water. #1: The southern shore of the Albemarle Sound. #2: At Pledger Landing, Laurie searches the sky for signs of rain. #3: Mom & Dad, on the water and at the Confluence. #5: Laurie and Jason, low in the water and with the sun and southern shore behind them. 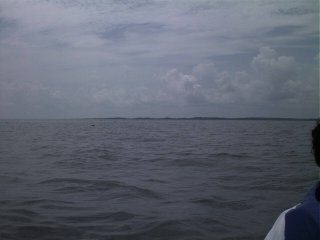 In Albemarle Sound, about 2.5 mi from land.